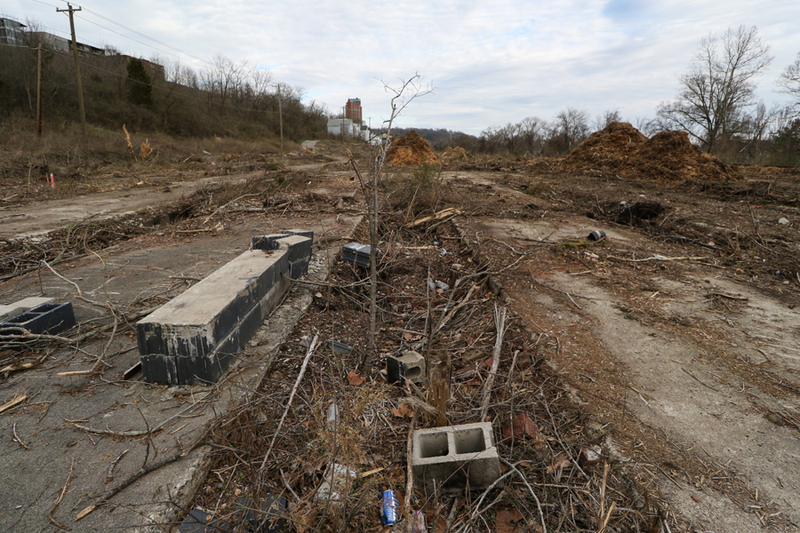 With land cleared for new development, some railroad ruins emerge. The "Oasis" line running from Downtown Cincinnati through the East End neighborhood has long been the talk of prospective commuter/light rail. It's easy to envision, even if no proposal has yet to gain serious traction. 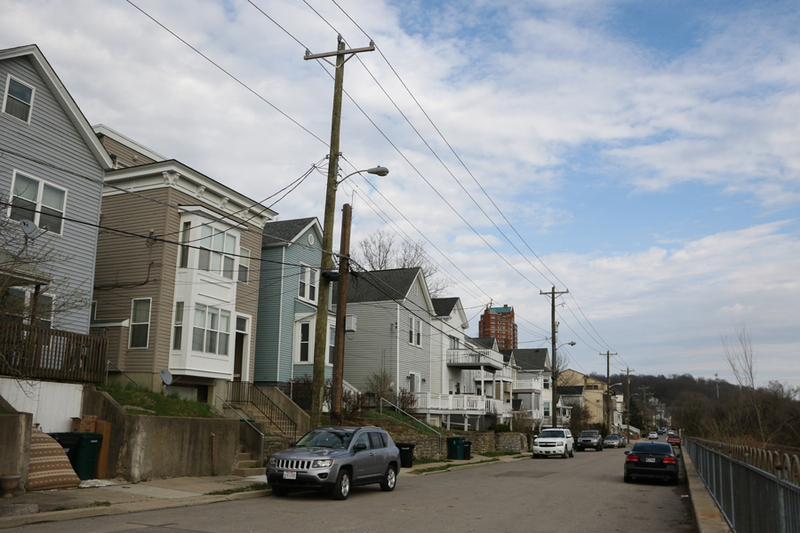 The line meanders along the river at the bottom of the hillside through housing and business districts before eventually connecting to the suburbs. As I noted in a November 2018 post, it has all the visual appearances of public transportation, pedestrian paths and roadways interact with the tracks all along the course. 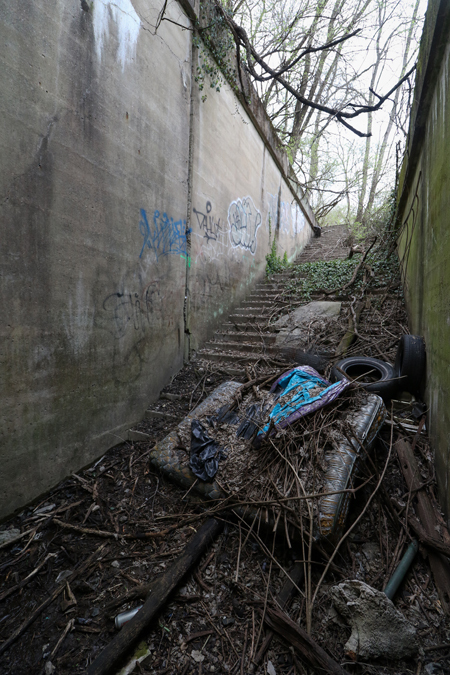 And as documented in multiple posts on this site over the years: there's even an abandoned passenger station with a peculiar sculpture. 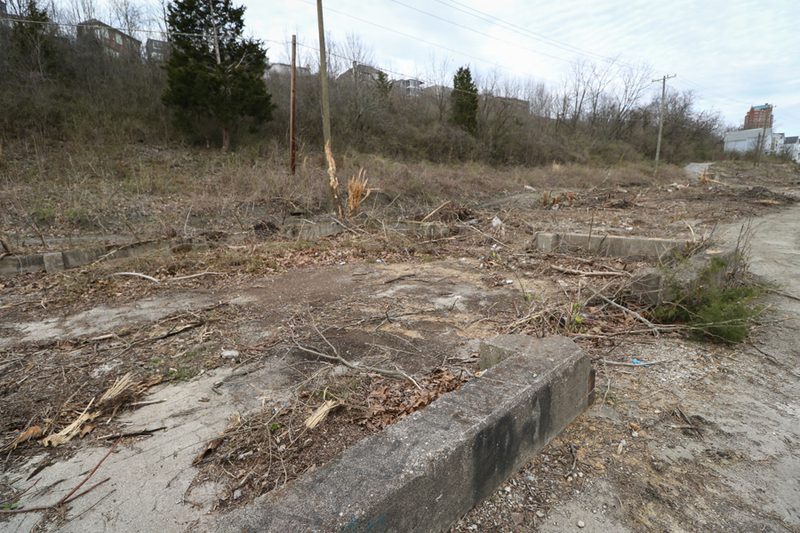 That abandoned station was the subject of the final story by WKRC Channel 12's Jeff Hirsch before his retirement. Jeff's an awesome guy and (shameless plug), I'm in the story. These days, the only trains that visit the tracks are the occasional freight train and excursions by the Cincinnati Dinner Train. These are the tracks that the Ringling Bros. circus train used to reach the riverfront arena and the right-of-way is owned by the local transit authority in the case it ever needs to be utilized for public transport. Future transit connections could be a hard sell, though, as these tracks pass incredibly close to homes and a neighborhood that is seeing renovations and new builds appear at a rising rate. 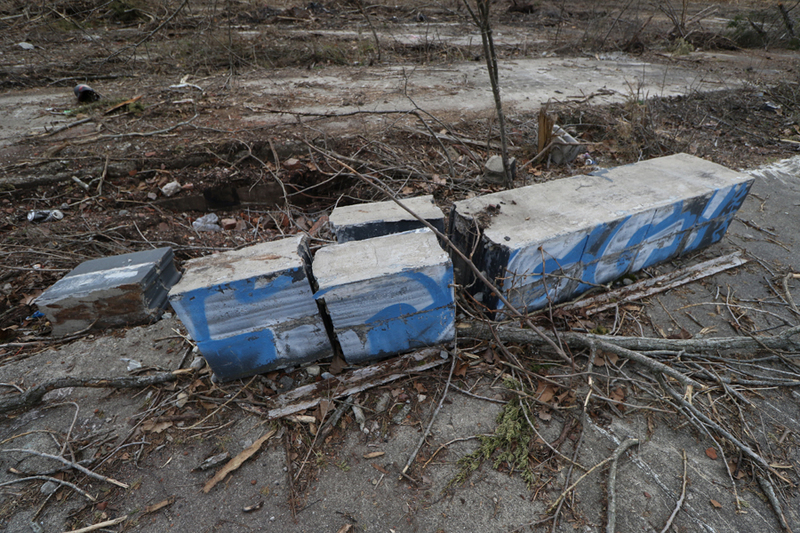 It's this increased development that's revealed even more railroad remnants. Described as what will be a "40-house subdivision," the latest construction in the East End could end up being the City of Cincinnati's first chance to host "Homearama," a homebuilding showcase typically found in the outer suburbs (yeah). 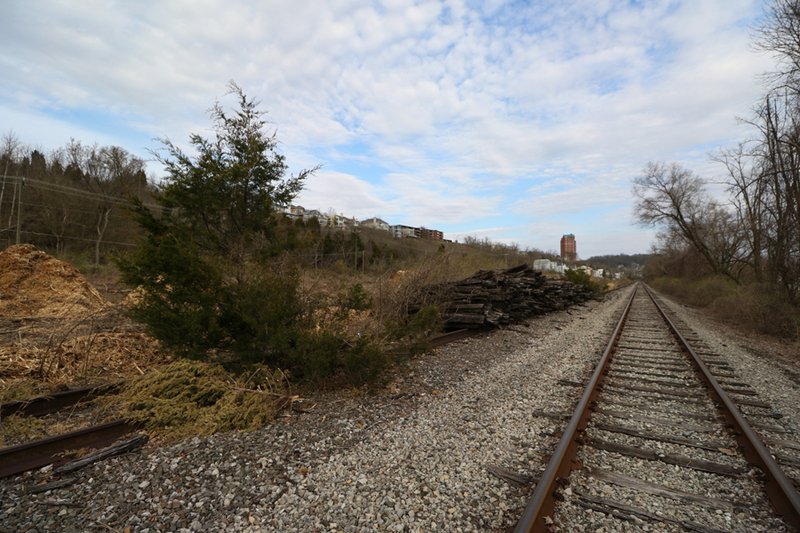 The Enquirer describes the project as: "Transforming what is now a vacant, contaminated rail yard into a neighborhood of tax-generating homes with river views." 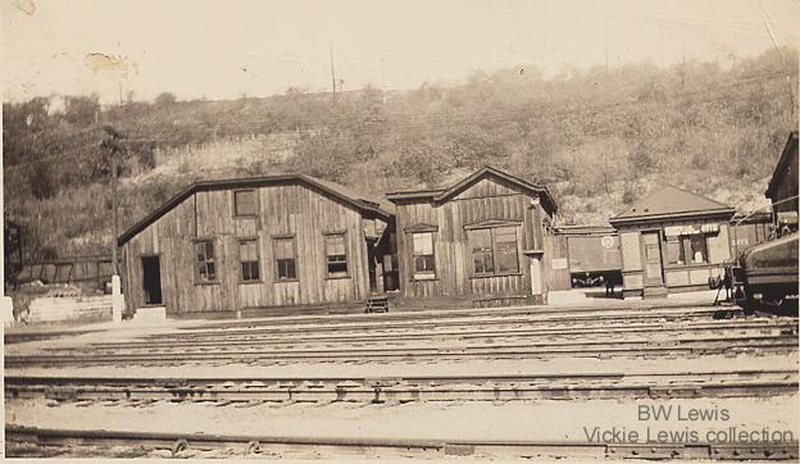 - Houses along the Oasis line/former Pennsylvania R.R. right-of-way. It's believed that many of these residences were once railroad employee homes. The proposed, Homearama-status-seeking development is currently in the planning stages. Whether or not a grand vision is realized (or accepted by the community) remains to be seen, but in the meantime: the space has been cleared. 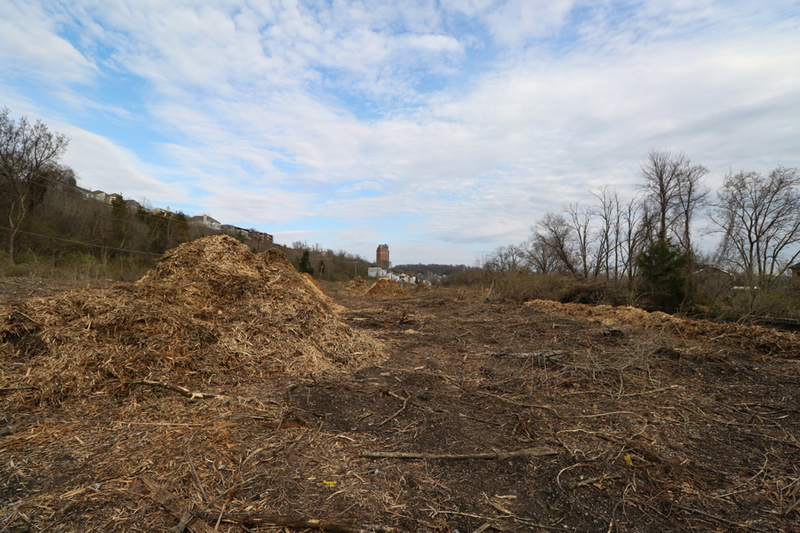 Beneath years of overgrowth that's now been chopped down and ground into large piles of mulch, the last remains of infrastructure could still be found. Railroad history is vast and often daunting to fully summarize. So, to any 'railfans' reading this: if I got something wrong in this post, or if you have something cool to add, let me know in the comments below. Here's what I could gather from The Pennsylvania Railroad in Cincinnati by Rick Tipton and Chuck Blardone (published 2004). Jeffrey B. Jackucyk also has some great information. The railroad facility once located here was referred to as "The Pendleton Yards" or "Pendleton Shops" (this area of the city was once known as Pendleton and differs from the downtown-adjacent neighborhood of the same name). This shops originally served as the main yard for the Little Miami Railroad (the rail company that predated the Pennsylvania R.R. in this area). 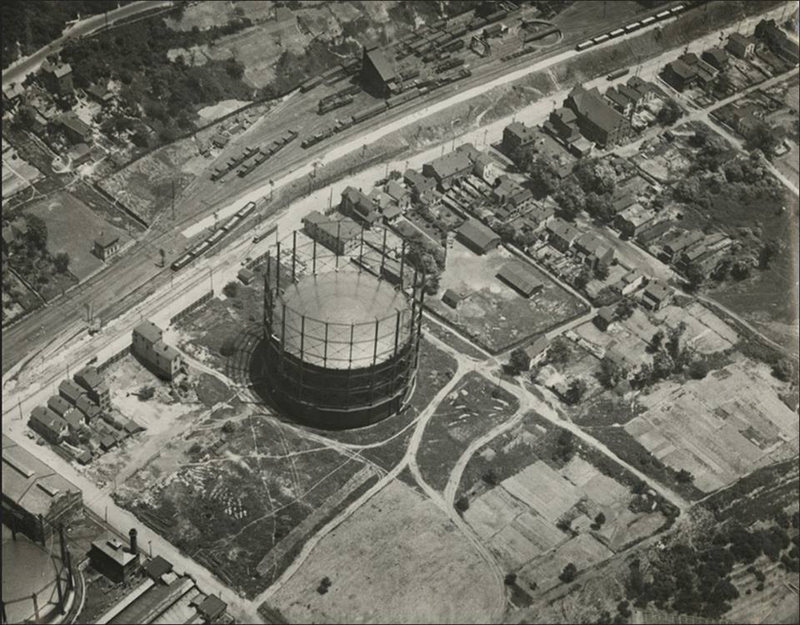 At one point there was a railway roundhouse. When the Pennsylvania R.R. took over these tracks, traffic increased dramatically and the main servicing facilities were moved Eastward to the "Undercliff" yard while the main passenger station (and the Torrence Road Station) were located to the West. 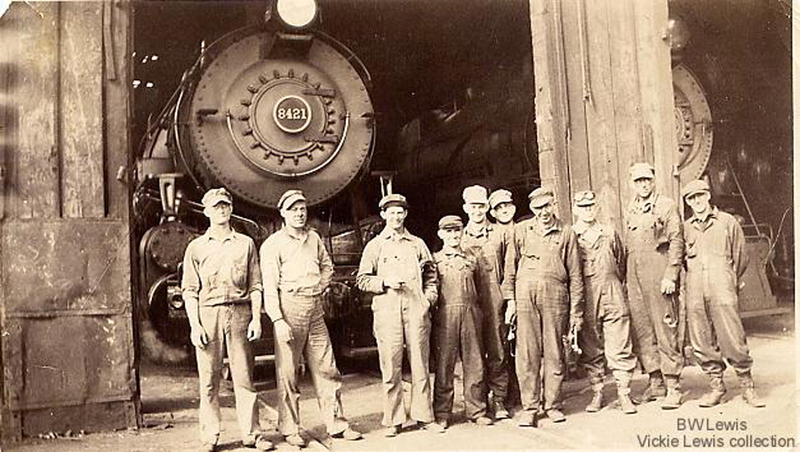 The Pendleton Yards survived as a space specifically to service locomotive equipment. Steam engines were serviced here in the early 1900s and a coal tower that could accommodate several vehicles once stood above. Facilities were later added to service diesel equipment. Engines like these bright orange DTI trains could often be found here in the 1960s. At some point, a dormitory for engine crews was built on site. Some sources list this dorm as having been a YMCA. 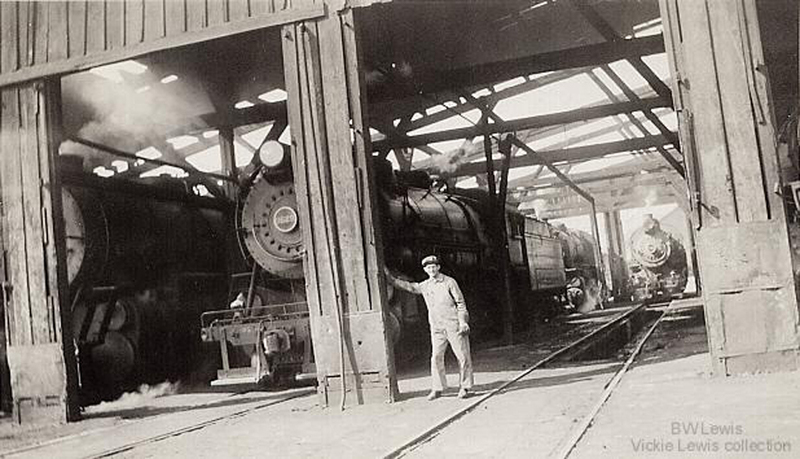 The yard is listed as having been opened 1841-1843, the city's first permanent rail yard. The site was chosen because locomotives were initially not allowed in the city's core (for fear of startling horses). Railroad passengers had to disembark and transfer to horse carts. Most sources seem to indicate that the yard was abandoned sometime in the late 60s/early 70s. 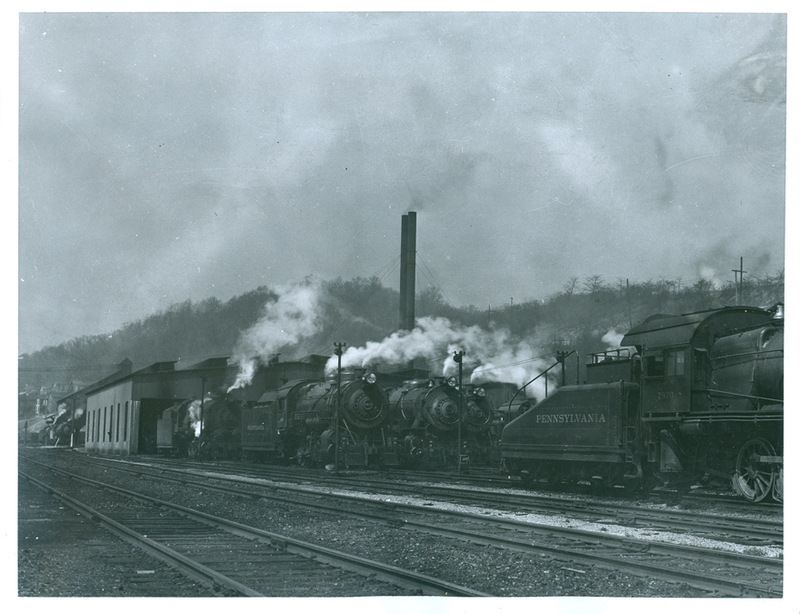 The yard couldn't be expanded due to space, but still remained in operation well after Cincinnati Union Terminal had opened. The once mighty Pennsylvania R.R. merged with longtime rival New York Central in 1968 to from Penn Central. The conglomerate would go bankrupt within two years and its remaining railroad lines have found themselves under a myriad of owners and operators in recent history. 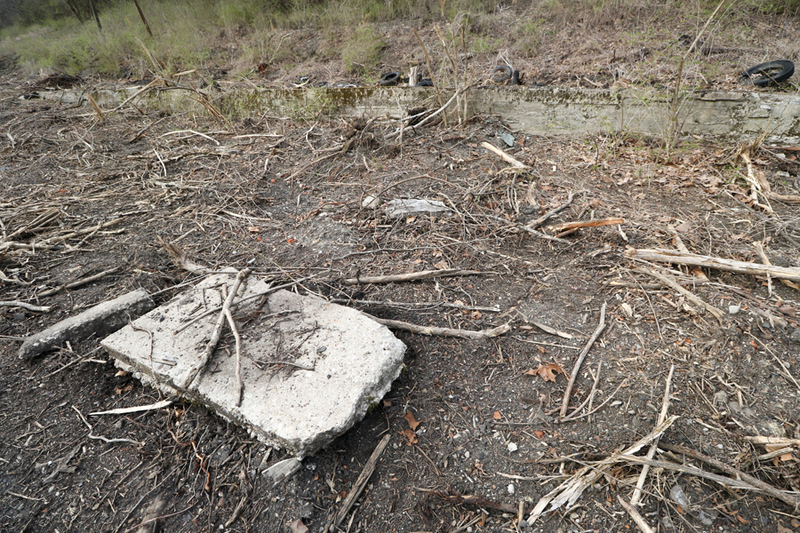 - Foundation of the former dormitory. The photographs in this post show what little is left of the Pendleton Yards. 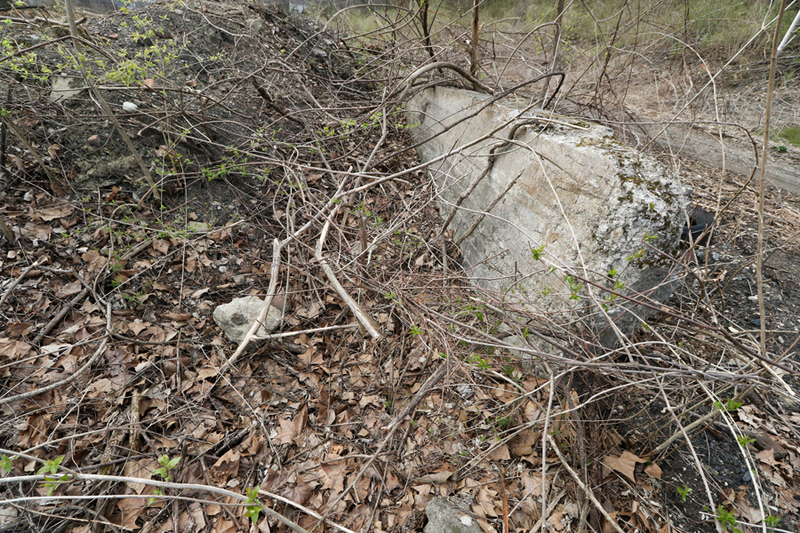 Most of the structures were demolished prior the land clearing. 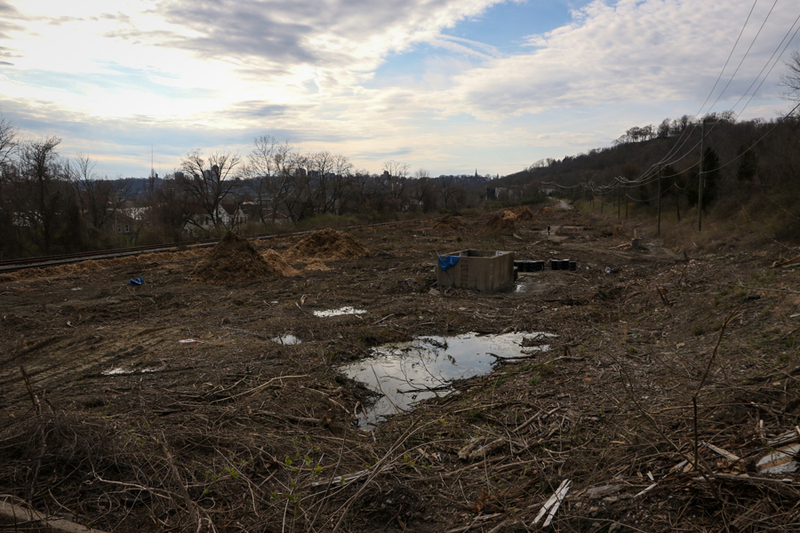 Years of coal storage, railroad cinder disposal, and chemicals used to clean/service vehicles have taken their toll on the land. Allegedly, the area will require an environmental cleanup before any serious construction begins. - Vegetation ground into mulch. 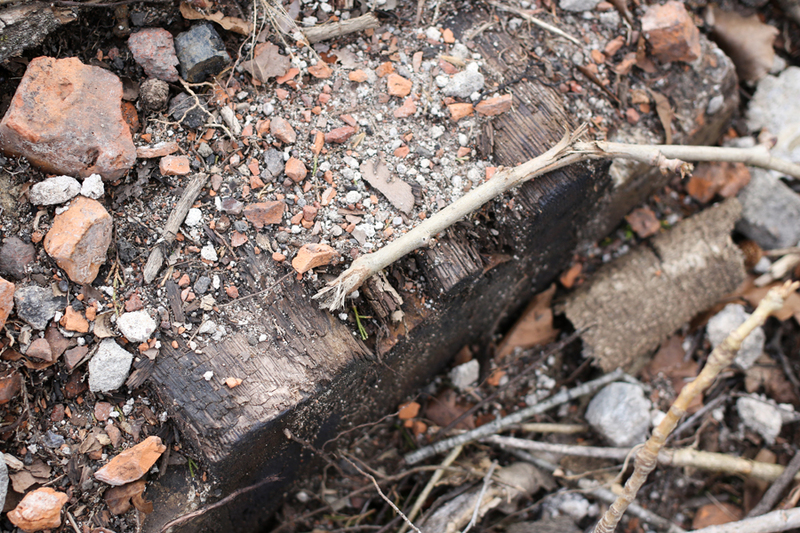 - Remnants of a wooden railroad tie still in place. - The former service pits which allowed workers to get beneath the locomotives can still be seen, despite efforts once made to fill them in. - Former building wall still adorned with graffiti. - Service pit and concrete paths that stood between parked engines. 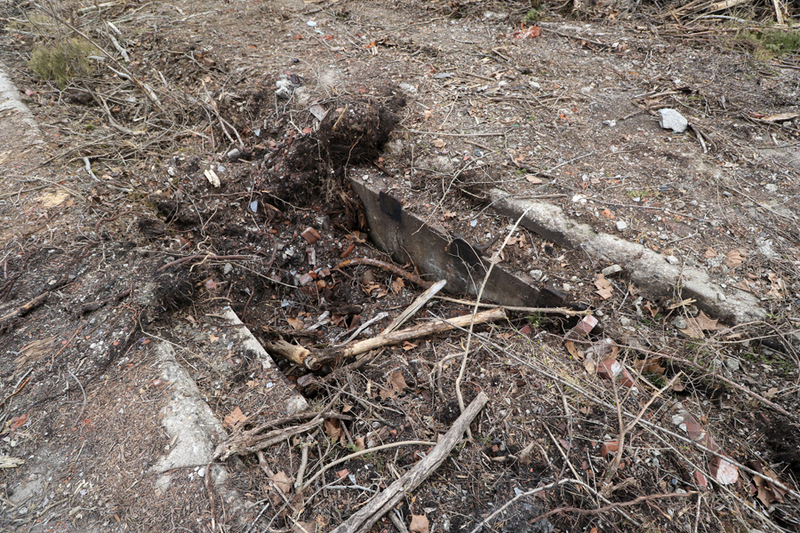 - Remains of a building foundation. 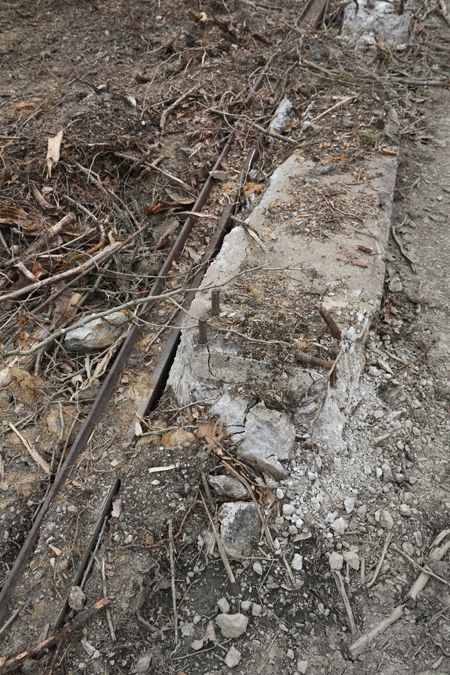 - Rails still line the floor of the former diesel engine service area. 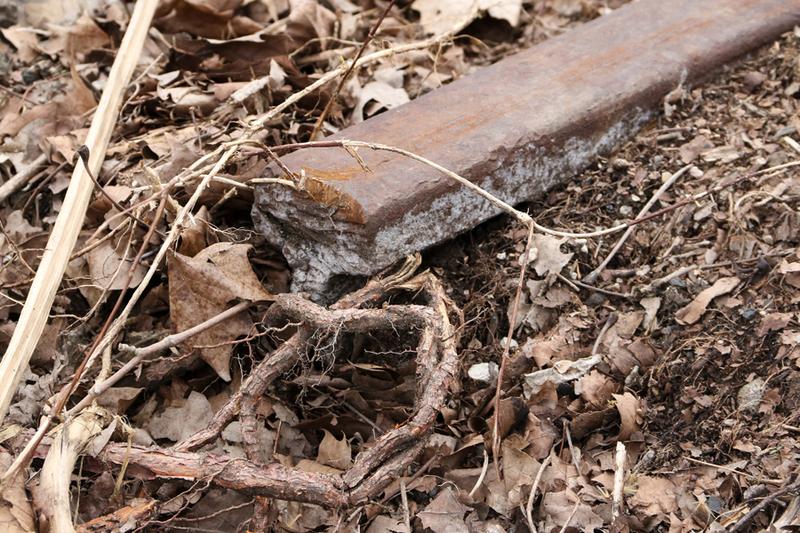 - A rusted rail still found in the ground. - A rail among the brush. 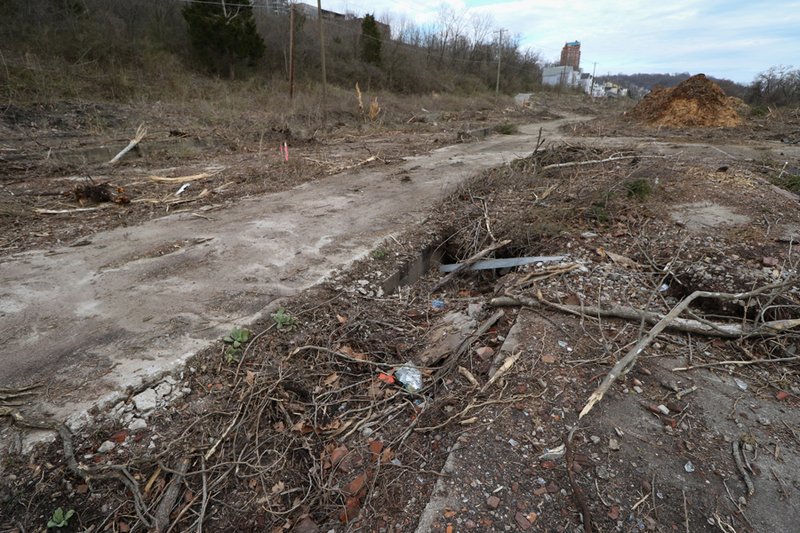 - The rail seen here would've once been found along the service pit, where trains would've slid off normal track and into the maintenance area. 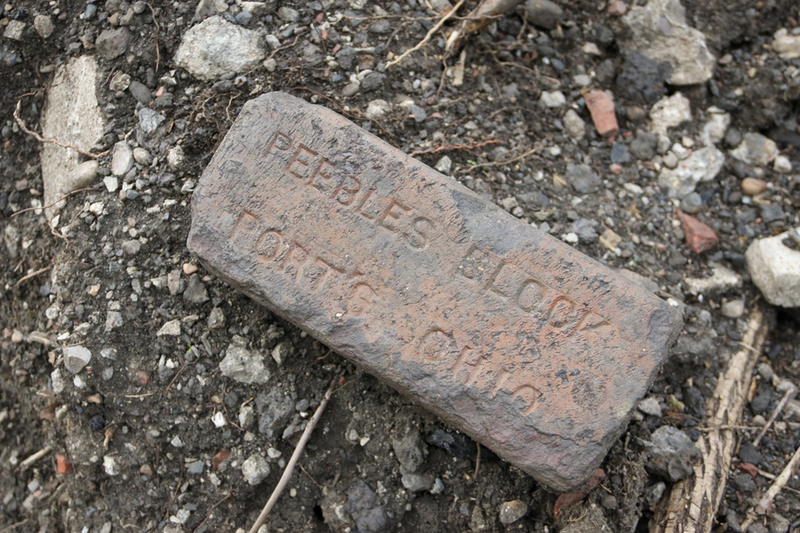 - A brick from the Peebles Block company in Portsmouth, Ohio. This website has great information on historic bricks of Ohio. The Eastern side of the state used to be a hotbed for the brick industry (as well as the railroad industry). 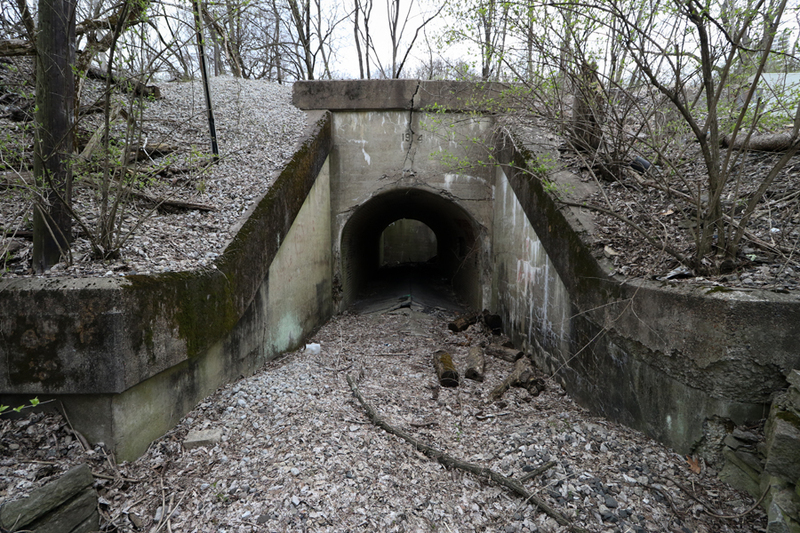 Abandoned Eastern Ohio trains have been documented here on QC/D before and the previously covered Roseville Prison once used inmate labor to construct bricks. When the Pennsylvania R.R. upgraded the Little Miami R.R. (known today as the "Oasis" line) by constructing an elevated right-of-way that no longer conflicted with pedestrian paths or roadways, they had to get clever with providing access around the tracks. Several small bridges, tunnels, and stairways were constructed to allow passage to people and vehicles. These structures often give the Oasis its deceiving (and frustrating/disappointing) appearance of being an active transit/commuter connection as a lot of them look like they lead to stations. 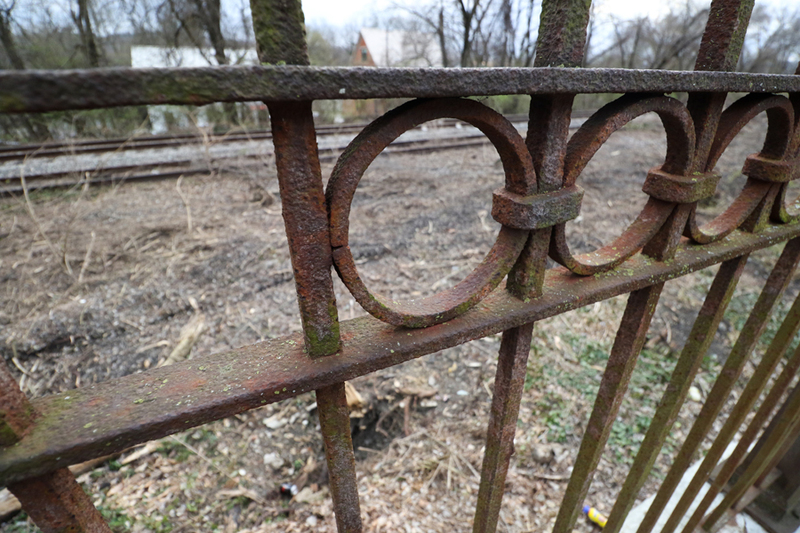 Per the aforementioned Eastern Corridor document: the iron decoration that adorns a lot of these pedestrian pathways was created by the Cincinnati Artistic Wrought Iron Company that was local to historic Pendleton. Many of the pedestrian/roadway connections (constructed of stone and iron in the early 1900s) still remain in use as of this writing. 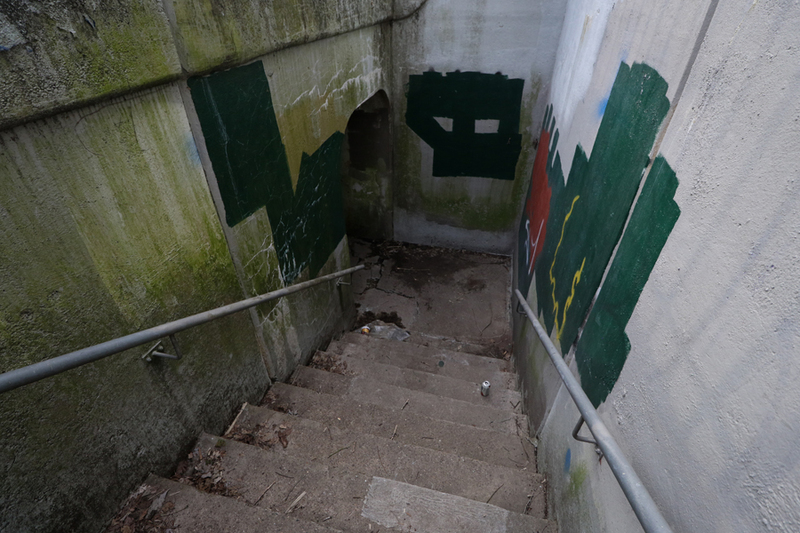 The stairwell seen above connects Riverside Dr. to Walworth Ave. (and gives neighborhood residents a secret passage to awesome eateries such as Eli's BBQ and The Hi-Mark). 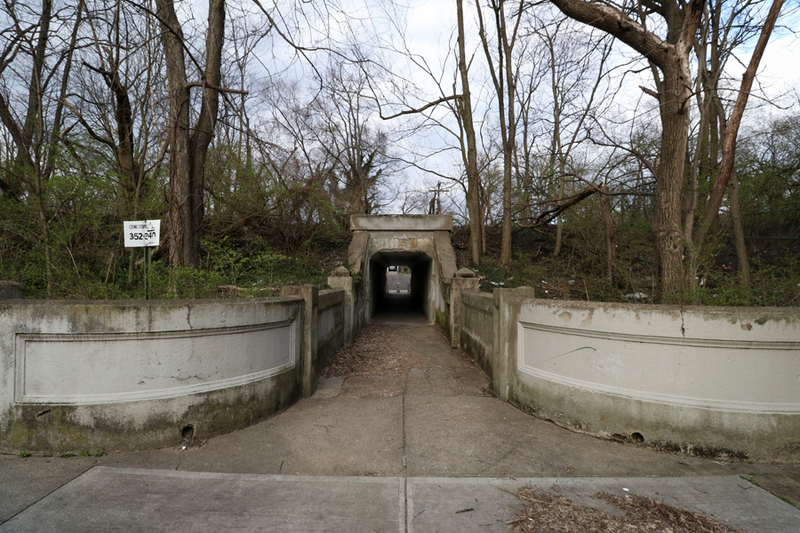 The one seen below carries Congress Ave. to Eastern Ave. past the still-lined-with-bricks Stacon St.
- Lancaster St. pedestrian tunnel as seen in 2010. 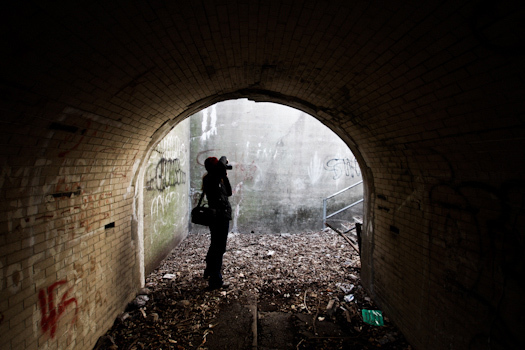 The Lancaster St. tunnel has by far the best example of the "coulda been a transit stop" vibe (further explored here). 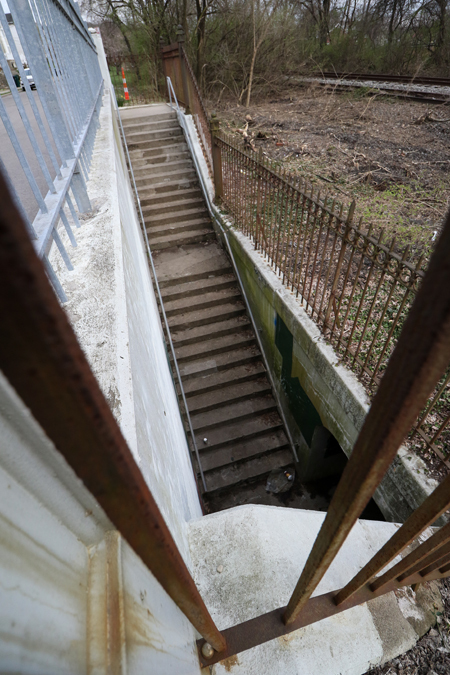 It's easy to envision walking up the steps onto a platform to catch your train into the city. But you can't. You can ride the dinner train, though, and I hear that's pretty cool. 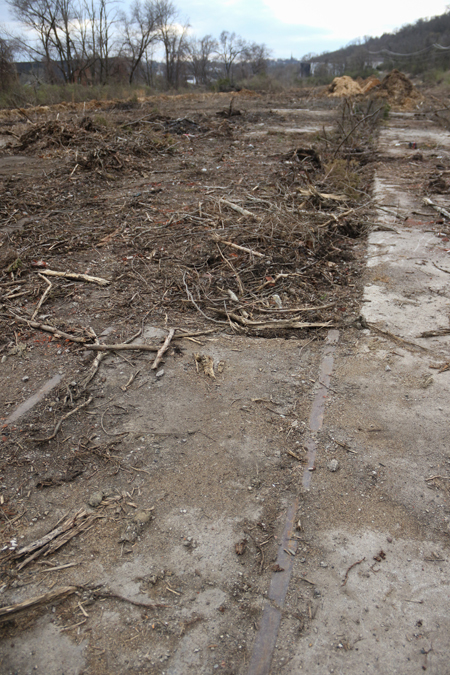 The remains of the Pendleton Yards are just another example of the vast amount of history and ruins that can be found adjacent to the "Oasis" line. 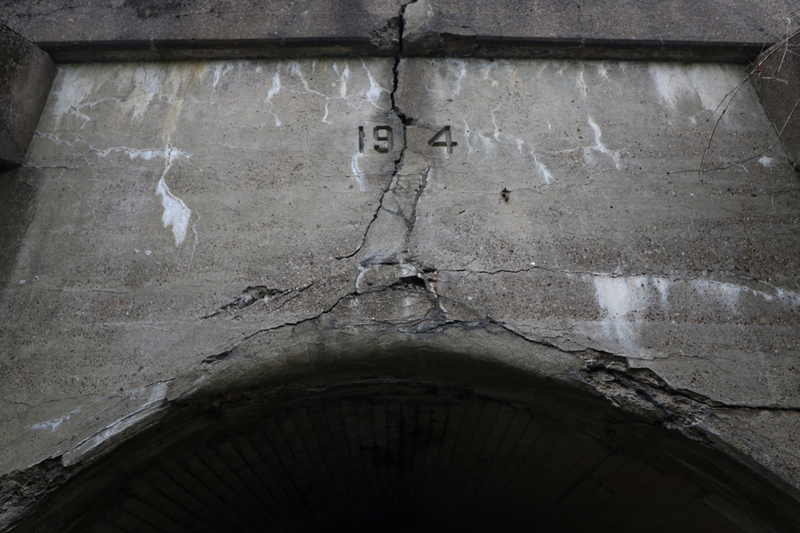 Even if they're slated for removal, there's still some great local archeology along the rails. 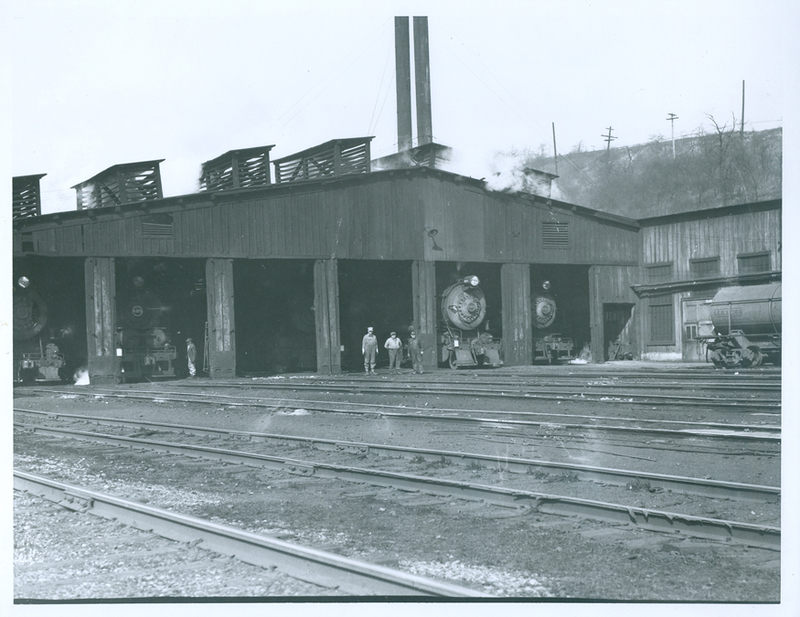 Special thanks to John Maggard who sent in these historical photographs of the Pendleton Yards. He accumulated these via online groups over the years, while a few were given to him by the late Gib Yungblut of the Cincinnati Railroad Club. Just rode the dinner train for the first time this past weekend. I was wondering what those stairs were and if they went anywhere, so this post is aptly-timed! How'd you like the dinner train? I've heard nothing but good things. The food was great, and the people running it are definitely passionate about the project. We got gift certificates as a wedding gift a couple years ago and finally got around to redeeming them. We happened to land on a special event night where they encouraged a couple of the cars to dress like it was 1949, and they also had singers for entertainment. We ended up waiting for a freight train, which meant that the entire 25-mile trip took a little over four hours. It was neat to check off another opportunity to ride on rails in Cincinnati and see a side of it (mostly the backside of industrial businesses) that I haven't seen before. Thanks, Crystal. That's good to hear! And congrats on the wedding! For further exploration, Ronny, I suggest you "tour" Gladstone Avenue off of Collins Street for more trackside homes and "archeology." I used to come down Collins on my bike every now and again. I may need to go back and check it out. 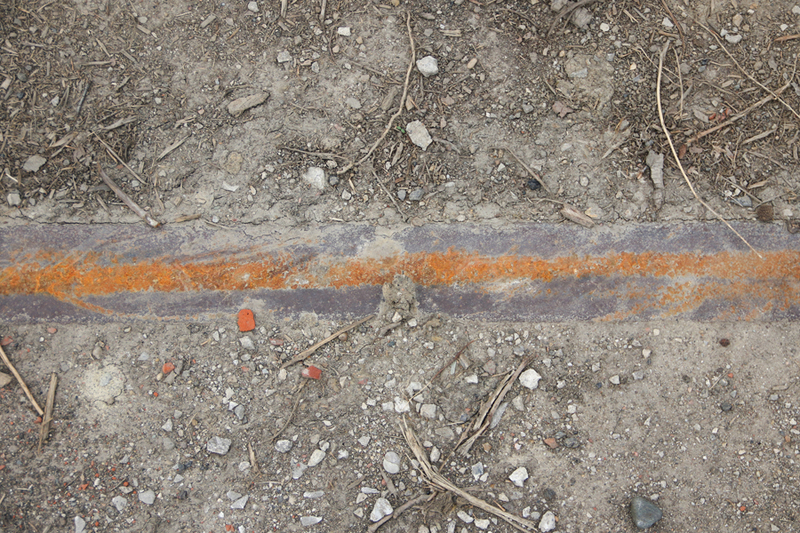 You can enlarge it to show details of the railroad ROW. It includes some details of the loction of the yards and roundhouse(?) you describe. 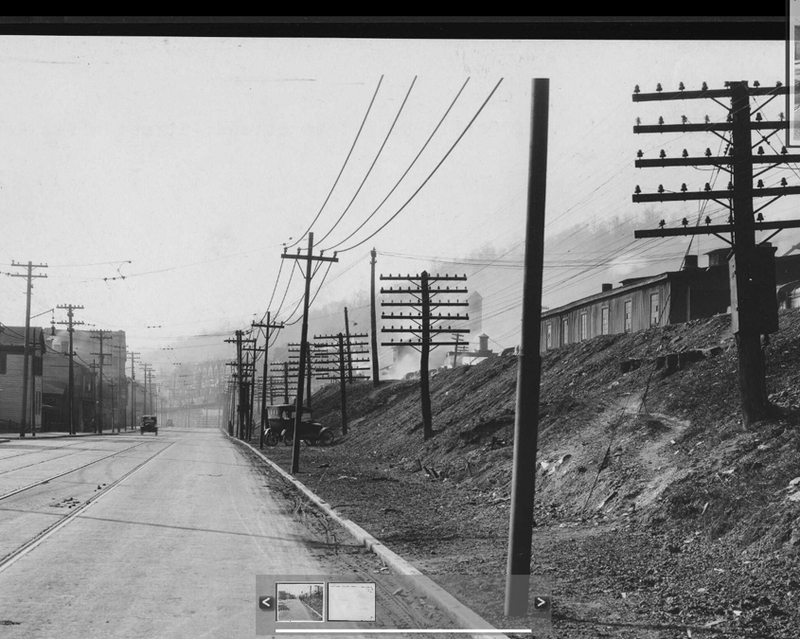 Also it shows streets prior to the construction of Columbia Parkway.